When you need printing done in a hurry, we'll have you in and out the door in no time. 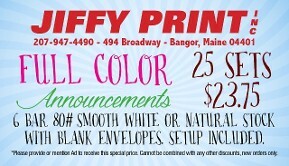 Jiffy Print Inc. in Bangor, Maine, offers professional printing services as well as on demand copying. Our state-of-the-art technology provides black-and-white copying for our walk-in customers, so no job is too small. We also offer digital full-color copying to compliment a full array of commercial printing services. If you're too busy to leave your office, we offer free pick-up and delivery along with our printing services. We have been family owned and operated for over 40 years. That means you can count on quality work, on budget and on time. Guaranteed! Contact us for professional copying services that set your business apart.